Oregon’s world renowned seed industry is made up of approximately 1,200 farm families, 50 seed companies and support industries. Grass seed is grown on approximately 400,000 acres in Oregon, 90 percent of which is located in the fertile Willamette Valley of Western Oregon. Grass seed production acreage encompasses nearly 25 percent of the total area of the valley, and 40 percent of its arable acreage. The industry produces approximately 600 million pounds of grass seed each year. Oregon-grown grass seed is used on home lawns, athletic fields, parks, pastureland, in reclamation projects and as a cover crop in agricultural operations. Oregon’s specialty seeds are known around the world as top quality seed for the production of vegetables, sugar, sprouts, livestock feed and ornamentals. Grass seed enhances water quality, helps prevent soil erosion, improves air quality, provides aesthetic value to landscapes and cools ambient temperatures on hot summer days. Ninety-eight percent of the grass seed produced in Oregon is sold out of state. 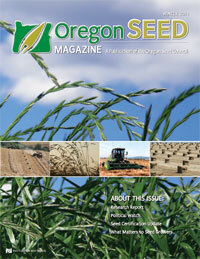 Fifteen to twenty percent is exported overseas as Oregon sells grass seed to more than 77 countries.